I hope you are having a great summer weekend. I have the perfect treat for a lazy sunny afternoon for you today. 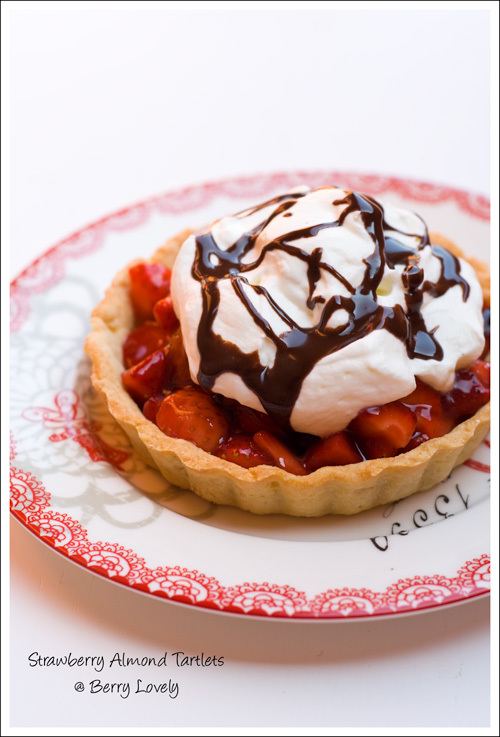 Strawberries, chocolate and cream - all combined in some wonderful tartlets. The tartlet shells contain both ground almonds and chopped almonds, and can be prepared in advance. The topping uses both heavy cream and sour cream, which gives it a nice tang. Enjoy! To make the shortcrust tartlet shells use a food processor and mix together the flour, ground almonds, sugar, salt, butter and the egg. Pulse a few times until the dough comes together. Wrap in cellophane and put in the fridge for about 30 minutes. Preheat the oven to 175° C (350° F). Grease your tartlet forms with butter. Roll out the dough on a lightly floured surface. Cut out rounds to fit your tartlet forms, and put them in the forms. Prick some holes with a fork into the dough. Spread the chopped almonds on top of each tartlet. Bake for about 15-20 minutes, until golden brown. Let cool on a wire rack, then take them out of the forms. Whisk together the corn starch and a few tbsp. of the juice until smooth. Bring the remaining juice to a boil. Add the corn starch mixture and let boil for about one minute while stirring constantly. Take off the heat and let cool. Clean the strawberries and cut into small pieces. Mix together with the juice mixture. 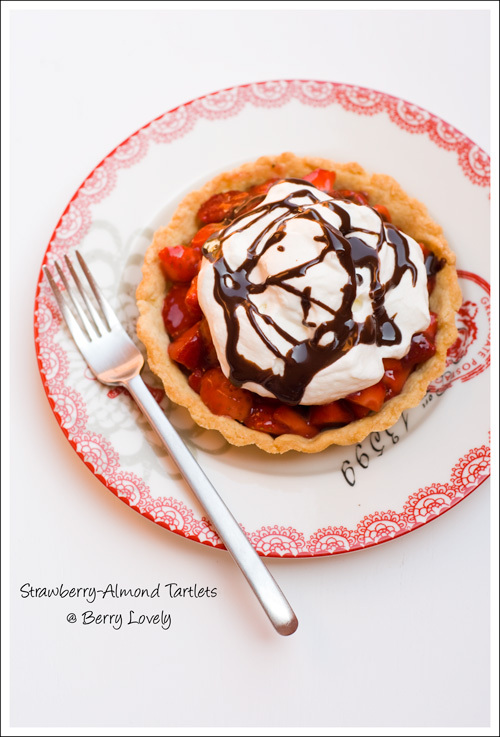 Fill the strawberries into the baked tartlet shells, and put into the fridge for about an hour. To make the chocolate sauce, bring the heavy cream to a boil. Take off the heat and add the chocolate. Stir until the chocolate has melted. Let cool for about 5 minutes. Whip the heavy cream until stiff peaks form. In another bowl using a handheld mixer whip the sour cream together with the vanilla and the sugar for about 2 minutes. Carefully fold in the heavy cream. Top each tartlet with a generous portion of the cream and some chocolate sauce before serving.